Two environmental human rights defenders were shot in Cajamarca, Tolima on Friday 28 July 2017. The two environmental defenders working for the Young Peoples Social and Environmental Collective of Cajamarca (Colectivo Socio-Ambiental Juvenil de Cajamarca – COSAJUCA) were shot at and narrowly escaped being injured or killed in Cajamarca on Friday, 28 July 2017. COSAJUCA is part of a large group of local organisations working to defend environmental and social rights. For the last four years, COSAJUCA have reported threats against members of their organisation for “defending [their] territory from the mining project of La Colosa”. In recent years, two members of COSAJUCA have been killed, in 2013 Juan Camilo Pinto, and in 2014, Daniel Humberto Sánchez. On 26 March 2017, 98 per cent of the citizens of the town of Cajamarca voted in a Popular Consultation (Consulta Popular)  against mining activities in the municipality of Cajamarca (Registraduria Nacional). As a result of this landslide vote, the town council formally banned all mining activity from the Cajamarca Municipality. 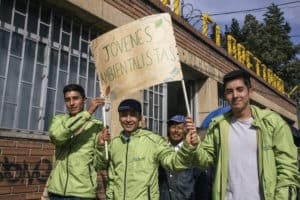 This means that whatever mining titles have been granted in Cajamarca by the National Mining Agency (Agencia Nacional de Mineria – ANM) can no longer be exploited. This is the first time a Colombian Town Council has banned controversial mega-mining projects. The real repercussions for mining projects of this vote were not understood at the outset by AngloGold Ashanti, which stated that it would have a minimal effect on their operations as these had been started 14 years ago, in 2003, and the decision would not be retrospectively applied. This idea was initially supported by the Minister of Mines, German Arce, who following the “No” vote stated publicly that a mining license for exploration has already been given to Anglo Gold, and that this kind of popular decision would not be applied retroactively. AngloGold Ashanti at the time of the Popular Consultation had still not acquired an environmental license. This is a requirement under Colombian law before embarking on the exploitation of natural resources. The citizens of Cajamarca along with academics and experts have been citing their concerns about the environmental damage that this mine would cause in an area renowned for agricultural production and natural beauty. Diverse reasons which range from the institutional, the political and particularly the social, with the recent referendum, oblige us to take the unfortunate decision to stop all project activities and with it all employment and investment, until there’s certainty about mining activity in the country and in Tolima. Subsequently, the Colombian Constitutional Court declared Article 37 of Law 685 of 2001 (The Mining Code), unconstitutional. This Article had stated that local and regional authorities could not exclude mining in any part of their territory. The Court considered that Article 37 of the Mining Code violated the principle of regional autonomy enshrined in the Colombian Constitution. It also recognised the right of local and regional authorities to elaborate their own development plans, known as Plans for Territorial Organisation (Planes de Ordenamiento Territorial – POT), and to exclude mining from certain areas of their department based on sound technical reasoning. The right of communities to hold Popular Consultations and the Constitutional right to local autonomy and the right for local authorities to develop their own POTs has opened up an opportunity for local communities to effectively participate in decisions that impact on their lives and the development of their region, and has provided the opportunity for civic action to bring about effective change. This can only be positive in a country that is trying to move away from the use of guns and to build peace – sustainable peace is only ever achieved if it comes with social justice and the upholding of human rights. The attacks, threats and killings of environmental and human rights defenders threatens the upholding of social justice and human rights and the possibility of a sustainable peace in Colombia. In 2016, 80 human rights defenders were killed in Colombia and of those, according to Global Witness, 37 were land and environmental defenders. BBC News, Colombia minister in battle over Cajamarca mining ban (28 March 2017). Law 134 and Law 1757 establishes that the results of this type of citizen participation mechanisms, if the result obtains the necessary threshold of votes is mandatory and binding. See El Espectador, AngloGold Ashanti suspende operaciones en La Colosa: cerca de 400 trabajadores serán liquidados (27 April 2017). Maria Hoyos, Business and Truth Telling: The Bittersweet Case of the Colombian Peace Process (24 May 2017). See also BBC News, Colombia minister in battle over Cajamarca mining ban (28 March 2017).